I didn't think I was going to put a tree up this year in hopes we would be moving out of the apartment before Christmas, but it looks like it will at least be January before we move so the tree is up ... but really, what is Christmas without a tree?! We have had this artificial tree for about 5 years. It is a decent size and has some pretty nice full branches. One major selling point was it is pre-lit; makes for super easy setup and teardown! This year, however, our tree is struggling a little bit. When the tree made the move from the farm to the apartment somewhere along the way one of the base stand pieces went missing. Last year the hubby and I used random items to prop it up and this year is no different. 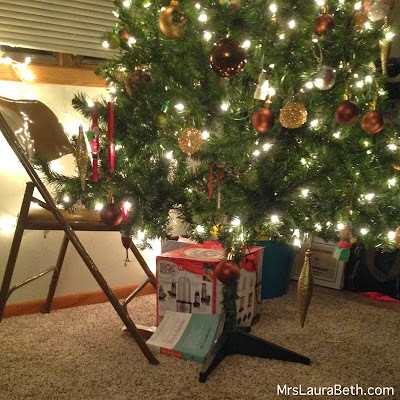 The book, the box and the chair are all needed in aiding the balance of this little tree. A new hiccup has been added this year … A Black Hole. Just a tiny little section of lights that didn't want to come back on this year. I know if I found the one bulb that is out and replaced it, the black hole would disappear but that is too many lights to check so I'm okay with the black hole! Join me tomorrow to see what my favorite ornaments are and why! Be Sure to Click Below and check out this Awesome Blogger!! I love your tree. We have a pre-lit small tree that we have had since our first christmas together. My hubs was to get a new one next year but I don't know if I can get rid of it. the magic bullet is amazing!!!! and so is your tree!! 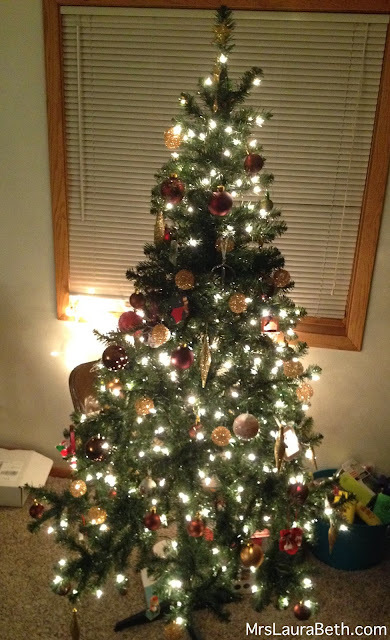 We use a real tree wannabe as well, not my choice, but it makes the Manfriend happy. I invested in several piney smelling candles, which help me with my fresh from nature tree fix. My favorite so far is a Mint Cypress candle, it smells so clean and holiday fresh. Your tree looks awesome! Your tree is cute!! I've never wanted a tree with pre-attached lights because I always wondered what would happen if the lights stopped working...although I think my husband would prefer the ease of the pre-attached lights! We have a pre-lit as well. Usually it is easy to put up but this year it the lights decided to be difficult and it took 3 hours and a couple glasses of wine to get the thing lit up properly. This was our first year for a real tree, and there were moments while stringing it with lights that I almost wish it was a prelit fake tree. Nothing worse than being attacked by the pine needles! 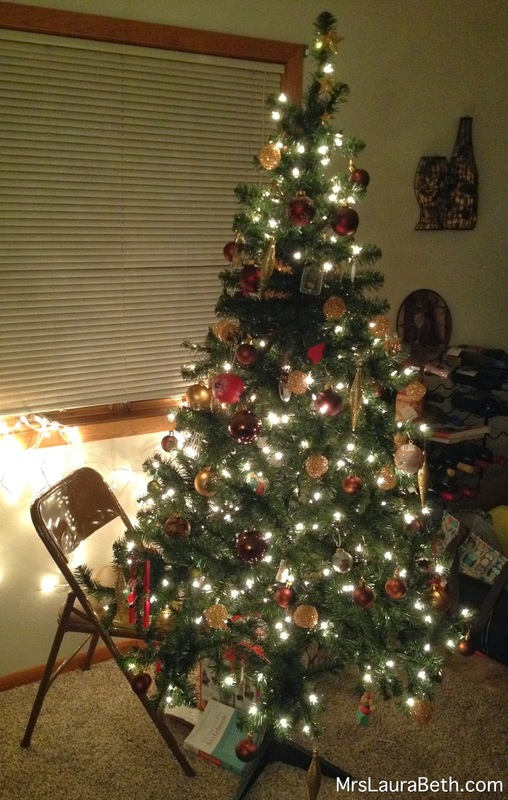 But now that it's fully decorated, I am loving our real tree. I loved our fake tree, too...but it was the tree I grew up with at my parents' and every year more and more of the bristles would fall off. It was time for a change! Well for being legless, it is still looking great! Ours fell over this year... it must be the year of crazy trees. i am so happy that you decided to have a tree after all. and i love its little quirks! those are what memories are made of. and it's still so festive! Thanks. It really makes me so happy to have the tree up! I know I think I'll always have an attachment to this tree. It was the first one I ever had with Steve when we were dating in college. I think once we move to a house this will become the tree for our basement! Haha thanks. Now I think I need a smoothie!! Thanks it just makes it so warm and cheery!! Thanks and now I'm going to look for that candle!! Ya maybe next year I'll take the time to find the bad bulb hehe thanks!! Oh my goodness ya that is what I was afraid of and it would take me FOREVER!! Ya I'm thinking next year we will have a real on and this one will be placed in the basement. Haha your old tree sounds like my parents old one, I think there is duct tape all over it!! I know I just had to, it didn't feel like Christmas without it!! Haha yep. I'm thinking this tree will have a spot in the basement next year and we will get a real one for the main living room! !